(Los Angeles, CA) – First Look Studios proudly announces the DVD release of Birds Of America, a comedy that explores the relationships between siblings and how they come together as a family despite their differences. the ties that bind them and what it means to be a family. 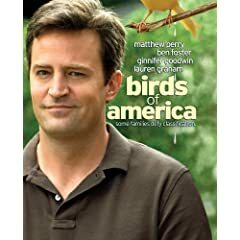 Birds of America is available on DVD on October 21, 2008 at an SRP of $28.98. your entries using the comment form below. Contest ends on 20th October, 2008.